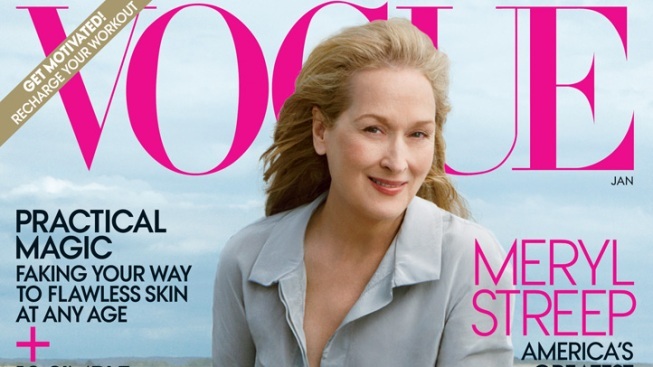 Meryl Streep covers Vogue's January issue. Up until now, the closest Meryl Streep has ever gotten to the cover of American Vogue was playing the role of Miranda Priestly in The Devil Wears Prada -- a character that was reportedly inspired by Anna Wintour herself. Now, the 62-year-old legendary actress has landed her very first Vogue cover in the magazine's January issue, where she was photographed by Annie Leibovitz by the ocean (much like Charlize Theron in December issue) wearing a belted Carolina Herrera dress. Streep is also photographed in Washington, D.C. alongside the women who are currently campaigning for a National Women's History Museum -- including Madeleine Albright and Dr. Maya Angelou. Vogue's January issue hits stands December 20th.